Spinal decompression therapy is a non-surgical, comfortable treatment for the relief of back and leg pain or neck and arm pain. During the procedure, you will be cycling through distraction and relaxation phases. Through proper body positioning, a spinal disc can be placed under negative pressure, causing a vacuum effect within it. How does negative pressure affect a disc? During spinal decompression therapy, a negative pressure is created within the disc. Because of that negative pressure, disc material that has protruded or herniated can be pulled back within the normal confines of the disc, and permit healing. What system is used for this purpose? After significant research, Complete Health of Lawrenceville chose the Kennedy Decompression Technique. 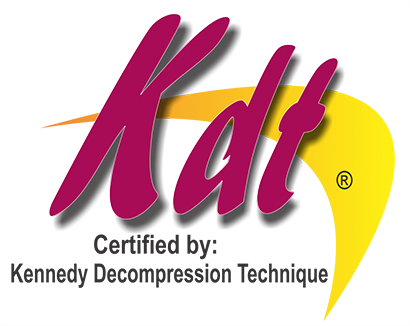 Our practitioners are certified by Dr. Jay Kennedy, DC, one of the leading experts in spinal decompression. Dr. Kennedy has been a chiropractor for more than 30 years and was involved in decompression therapy since its genesis. He has trained doctors worldwide and treated thousands of patients using a variety of decompression techniques. 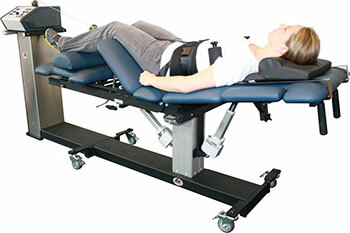 Spinal Decompression therapy is designed to unload the spinal disc. Any back or neck pain caused by a damaged disc may be helped by spinal decompression therapy. These conditions include herniated, bulging or protruding discs, spinal stenosis, and pinched nerves (sciatica). Spinal decompression therapy is usually not recommended for pregnant women, or patients who have severe degeneration or nerve damage. However, every patient is evaluated on an individual basis. Are treatments painful and how many will be needed? In almost all cases, the treatments are completely painless. In fact, some patients fall asleep during the session. The specific treatment plan will be determined by the doctor after your examination. Most of the plans fall within 12 to 30 treatments. Most medical insurance plans do cover this treatment. Our office will verify coverage before the treatment begins. We strive to provide exceptional comprehensive care for our patients. Learn more about the variety of services Complete Health can offer you. Familiarity is important! Learn more about the physicians and staff of Complete Health of Lawrenceville. Have questions? We have answers! Reach out to us by clicking the button below and we will respond to you as soon as possible. "My experience with your office has been outstanding. I came here not knowing what was going to happen. The pain I had was so bad I could barely walk. After my first treatment, I felt so much better. I tell everyone in my family and all of my friends how great this office is and that if they need a Chiropractic office, this is the one!"" "I started here about 18 months ago for chiropractic care. I have received wonderful treatment in a warm and inviting atmosphere. I love that they have so many different services on site; they all communicate with each other to be sure you are getting all the help you need. I even brought my teenage son here when he had a sports injury and the physical therapists were great with him." "Has everything you could need to recover from an injury or pain issue. Chiropractors are both wonderful and the staff is so pleasant. Would absolutely recommend this location."